Rise in population with increasing disposable income across Asia Pacific is driving the demand for air conditioners. This is encouraging global air conditioner market players to shift production of air conditioners close to consumption markets. For example, Japanese air conditioner manufacturer Daikin Industries, Ltd. has set up air conditioner manufacturing plants in Thailand, Malaysia, and India which experience high demand for air conditioners. In May 2018, Daikin started operation of a new air conditioner manufacturing plant in Vietnam to meet the increasing demand for air conditioners in Asia Pacific. Daikin established the new plant in Vietnam due to rise in residential air conditioner demand in the country. Globally, rising demand for VRF systems led to Japanese air conditioner manufacturer, Mitsubishi Electric Corp. to shift its production of VRF indoor units from Japan to Thailand in October 2014. Similarly, in October 2014, Mitsubishi Electric shifted production of residential air conditioners for the U.S. market from Thailand to Mexico. Thus, localizing AC production is increasing the demand for air conditioners. Rise in smart, connected air conditioners is a good opportunity for market players. Internet of Things (IoT) has influenced all industries including consumer durables. Rise in IoT-enabled smart, connected air conditioners present a good opportunity for global air conditioner market players. For example, Swedish appliance manufacturer, Electrolux AB which had launched connected air conditioners in August 2015, expanded its smart appliances collaboration with U.S. based software giant, Google Inc. in August 2018. Google will help Electrolux in developing connected air conditioners that work with Google Assistant and the air conditioner can be controlled by voice command. Electrolux AB is expected to launch voice based, connected air conditioners in early 2019. In August 2018, Japan based consumer goods company Panasonic Corp. announced a pilot project with Vodafone Group plc to utilize Narrowband-IoT (NB-IoT) for IoT-based home appliances. The project includes home appliance products such as air-conditioners. Thus, growth of smart, connected air conditioners present a good opportunity to air conditioner manufacturers across the globe. 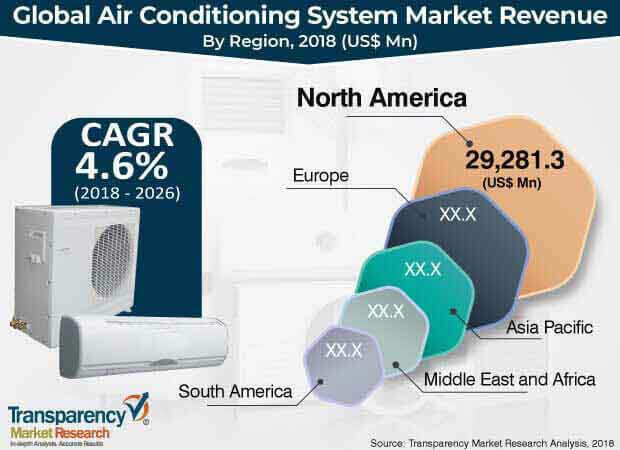 The study provides a conclusive view of the global air conditioning system market by segmenting it in terms of product, application, end-use, and distribution channel. In terms of product, the global air conditioning system market has been classified into split AC and window AC. Based on application, the market has been segmented into RAC (Room Air Conditioners), PAC (Packaged Air Conditioners), and VRF (Variable Refrigerant Flow) air conditioners. VRF air conditioner systems are also known as VRV (Variable Refrigerant Volume) air conditioners. Based on end-use, the market is segmented into residential and commercial. In terms of distribution channel, the global air conditioning system market is segmented into online and offline. Low penetration of air conditioners presents a good opportunity for market players. Compared to developed regions, in developing regions, penetration of air conditioners is low compared to other household consumer durables such as refrigerators. In 2017, in Western Europe, with a population of 450 million, and an urban population rate of 78.0%, the penetration of air conditioners was~10.0%. In 2017, North America with a population of 362 million, with an urban population rate of 82.0%, had penetration of air conditioners at just above 20.0%. In 2017, in Australia, New Zealand, and Japan having a population of 157 million, with an urban population rate of 93.0%, the penetration of air conditioners was below 40.0%. In China and Southeast Asia, having the largest population of 4,113 million, with an urban population rate of 44.0%, the penetration of air conditioners is less than 40.0%. This presents a huge opportunity for growth of air conditioners across the globe. This report on the global air conditioning system market provides analysis for the period 2016–2026, wherein 2017 is the base year and the period from 2018 till 2026 is the forecast period. Data for 2016 has been included as historical information. The report covers market dynamics including drivers, restraints, opportunities, and trends that are expected to influence the expansion of the global air conditioning system market during the said period. The study provides a comprehensive analysis on market growth throughout the above forecast period in terms of value estimates (US$ Mn) and volume estimates (‘000 Units) across different geographies. Rise in the global construction sector is increasing the demand for air conditioners of various types. Rise in construction activity both in residential and commercial sectors across the world is expected to increase the demand for air conditioners. North America and Asia Pacific are two of the fastest growing construction markets in the world. In 2019, construction sector revenues in North America and Asia Pacific are expected to grow 3.0% - 6.0% and 7.0% - 10.0% respectively. Both the U.S. and Canada in North America are witnessing an increase in residential construction due to government funding which is increasing the demand for air conditioners. According to the U.S. Census Bureau, in the U.S. residential construction sector, revenue has increased from ~US$ 0.3 Bn in January -10 to ~US$ 0.6 Bn in January-18 and non-residential construction revenue has increased from ~US$ 0.6 Bn in January2010 to ~US$ 0.8 Bn in January 2018. Total construction sector revenue has increased from ~US$ 0.8 Bn in January 2010 to US$ 1.30 Bn in January 2018. Low interest rates in the U.S., U.K., Germany, and Japan are increasing construction activities. Thus, rising demand from the construction industry is increasing the demand for air conditioners. The study provides a conclusive view of the global air conditioning system market by segmenting it in terms of product, application, end-use, and distribution channel. In terms of product, the global air conditioning system market has been classified into split AC and window AC. Based on application, the market has been segmented into RAC (Room Air Conditioners), PAC (Packaged Air Conditioners), and VRF (Variable Refrigerant Flow) air conditioners. VRF air conditioner systems are also known as VRV (Variable Refrigerant Volume) air conditioners. Based on end-use, the global air conditioning system market is segmented into residential and commercial. Based on distribution channel, the market is segmented into online and offline. The analysis of the above segments is based on present and forecasted global demand for air conditioners and the prevailing and future trends in the market. We have analyzed the present and estimated regional market size of air conditioning systems across North America, Europe, Asia Pacific, Middle East &Africa, and South America. The regional air conditioning system markets are further broken down into country level markets in the following geographies: the U.S., Canada, Russia, Italy, Spain, France, U.K., China, Japan, India, GCC, Nigeria, and Brazil. The global air conditioning system market consists of global players as well as large number of medium and small players. The report includes detailed analysis of the global air conditioning system market, SWOT (Strength, Weakness, Opportunity, and Threat) analysis of the market, Porter’s Five Force analysis, key macroeconomic indicators influencing the market, air conditioning system market regulations in various geographies, and trends. The industry analysis includes value chain analysis of the global air conditioning system market. These market players have been profiled in terms of attributes such as description of the company, financials, products, and key strategies to increase market share in the global air conditioning system market.